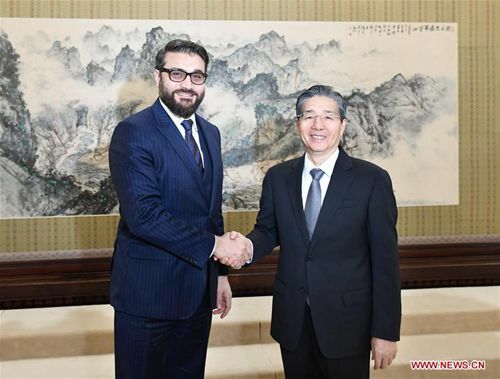 Guo Shengkun, a member of the Political Bureau of the Communist Party of China (CPC) Central Committee, met with Afghan president's national security adviser Hamdullah Mohib Friday in Beijing. Guo, also head of the Commission for Political and Legal Affairs of the CPC Central Committee, called on China and Afghan to implement the consensus reached by the two heads of state and continue to advance the strategic cooperative partnership between the two countries. China's law enforcement and security departments stand ready to enhance cooperation with Afghan in counter-terrorism, border security, institution and personnel security, so as to safeguard security and development interests of the two countries, and promote regional peace and stability. Mohib said Afghan will resolutely fight against terrorism, and stands ready to deepen law enforcement and security cooperation between the two countries.